I do it on two different bikes. Works like a charm. I keep the total number of teeth between the two different setups the same and I don't need to change the sliders (or ebb on my other bike) when I change gears. One gear always ends up a little looser but not bad enough to need to move sliders. I am confused. I was thinking 2 cogs on a free hub side by side one 18 and one 20 and not touching the chain ring. Just move chain from one cog to another. Just use my multi tool to adjust sliders to move chain. I do 2 cogs and 2 chainrings. No, that would alter your chainline. A Dinglespeed is to run 2 rings and 2 cogs, the combination of each having the same number of teeth ie: 32/20 & 34/18. By this, chainlength remains unchanged between the two ratios and you can switch between the two easily. For example, running 34/18 on the road to the trailhead, then stopping to switch to 32/20 for the trail, capiche? Agreed....at that point it is no longer a SS....might as well just ride a geared bike. Yea I have heard people say this. I am not heavily considering doing a dingle because to me it adds weight and clutter. I thought my friend was talking about just using 2 rear cogs and having enough adjustment in his sliders to compensate. 8 speed chains are designed to flex while shifting gears so surely they could handle going from one cog to another just fine. That said I agree it would be taking away from the simplicity of it. 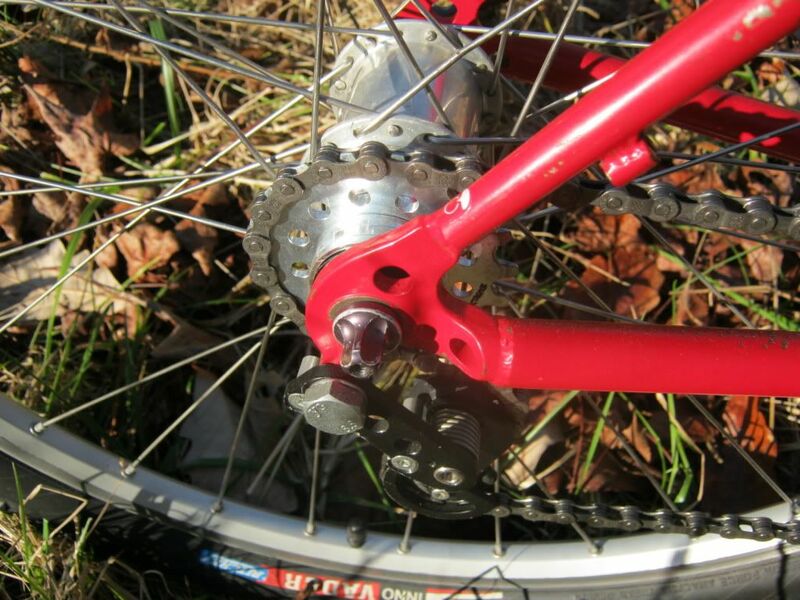 I just thought I would ask since my friend said he used to run 2 rear cogs on his XC bike. Obviously he doesn't anymore though lol. I got a 34 tooth race face narrow wide laying around and a 20 tooth surly cog as well. I have been toying with gear ratios since I built this new bike. I started with 32x20 and it FELT SO GOOD but then one day I hit a flat trail in Omaha and felt like I was going nowhere lol. So I talked to a few friends, posted something here and decided to give 32x18 a try. So I bought a Niner cog and I actually like that ratio but then again I have some killer trails I enjoy riding an hour away in the Loess Hills that are about as close to actual mountain riding as you can get in Iowa and I need lower gears for that. So I started thinking about 32x19 (best of both worlds) but didn't want to rush right out and spend more money so fast. So using some gear calculators just now I find that 34x20 is nearly identical to 32x19 and a little lower than 32x18. Problem solved for free. I will swap out that stuff this weekend and try it for a while. You've got the concept right but I've found it doesn't work unless you do a four tooth difference...ei 32/20 and 36/16. Tried it with 32/18 and 34/16 and it didn't work out, one was way too loose. the main problem with the dinglespeed concept is that both chainring-cog combination use the same chain accelerating the wear of the whole system. in extreme cases, if one combination is used more often then the other the chain may skip. ...and the dinglespeed solution eliminates the main benefit of ssing, the simplicity. 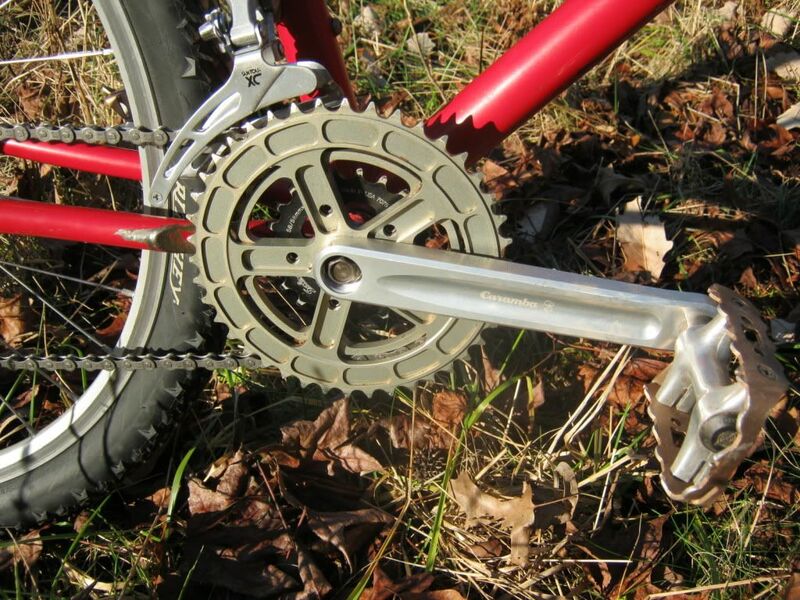 8 speed chains are designed to flex while shifting gears so surely they could handle going from one cog to another just fine. It's a little different on a geared bike because the derailleur holds the bottom section of chain in line with the rear cog. On a ss bike good chainline is imperative because of the tight chain and full chain wrap on the rear cog IMO. At that point it is no longer a SS....might as well just ride a geared bike. Incorrect. Street fixies with a flip flop rear wheel are considered singlespeed bikes, even if the other cog is different size. 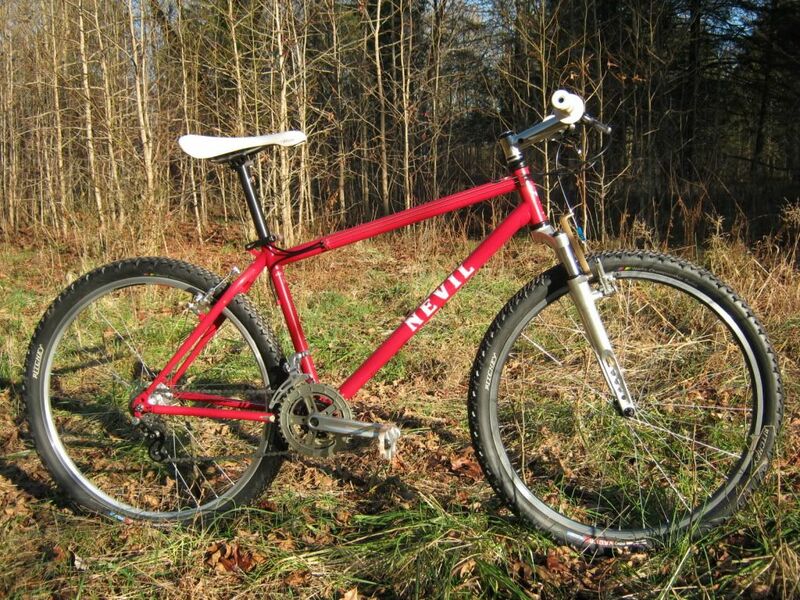 A dinglespeed is less simple than a "true" singlespeed only when it comes to aesthetics. The practical advantages (no chain slap, no worries about which gear you're in, diversity of the ride because of spinning for fast and mashing to climb etc.) remain. And even when it comes to the looks, a second cog and chainring don't stand out too bad. The size difference is smaller than in actual geared bikes. Dinglespeed is a good idea if you have a long commute to the trail. It can be really frustrating to spin on flat and smooth surfaces when your gearing is dialled for trail riding. My 29er has just one gear and I stay on trails as much as possible. The Moonlander is used for winter commuting, exploring and trail riding, so I've got 33/21 and 36/18 for that. If you are only unsure of your gear ratio, I would advise against dinglespeed. It's better to make one choice and give it a shot. But if you have longer stretches that are really easy and can't be avoided, then it makes sense. Don't let purists tell you you're somehow inferior for doing that. You're still riding a bike and riding a singlespeed bike. So would 28/21 and 32/17 work for a fatty? Don't let purists tell you you're somehow inferior for doing that. You're still riding a bike and riding a singlespeed bike. Thank you. Singlespeed, dinglespeed, tringlespeed, whatever--if it works, then it works. I've got a fattie dinglespeed as well. Trying to push 5" tires on the same gearing I used to ride to the trail would mean HAB the entire trail. Sure. I am running 30*18 and 26*22. Thanks 2:01 just for sake of clarity, that combo uses same chain length? If I understand this correctly, using ratios that are four teeth apart will keep the same chain length? The chainstay length does stay the same. I don't know if the "4 tooth" count is an accepted rule of thumb, but it makes sense to put in a big enough gap to make a dinglespeed worthwhile. Going up/down 2 teeth may make a noticeable difference, but for me, ~4 seems to work better functionally. Oddly the 4 tooth difference isn't working on my bike. I have 36/17 and 32/21. 36/17 is a hair too tight and 32/21 is too loose for trails. I bet I need a need different chanrings to tweek it. I have toyed with the idea of going 3 speed just for kicks with my friction thumbie shifter. I've been running dingles over for 20 years with great success and in numerous iterations. The 4 tooth/double ring set up is king. As far as those that argue it's not a single speed..... I'll be waiting for you patiently at the trail head while you spin like a gerbil. I've done this too. I did it on a hacked up drop bar gavel bike I built for fun many years ago. It worked well. I think it's called a 2x1 but I'm not sure on the proper terminology. Yup, but I'm even more of an SS black sheep...the Nevil is 3x1, lol. I run a White Industries Dinglespeed crank (35/38) and have 15/13 in the back. I just ordered a 12T and a 16T so I can play around with the gearing a bit. I'll end up with either 15/12 or 16/13 in the back. As it currently stands at 15/13, I have to adjust the dropouts when I change - completely defeating the purpose. i ride a pure SS in the dirt. but my two road bikes are 2x2, each has an 8 tooth change, for cruising-speed and big climbs. 44x16 and 36x24.